Stone veneer retaining walls such as this with planting behind must be carefully constructed for moisture control to prevent seepage into the CMU block core and ultimately discoloring the face. This veneer of stacked bluestone with contrasting rusty accents must be carefully hand set by a competent stone mason to achieve this degree of accuracy without visible mortar. With a stone veneer retaining wall, there's no end to the design opportunities. This beautiful wall is composed of thin quartzite that is used in two different ways to create a beautiful pattern of light value earth tones. This is the same material simply used on edge or flat against the face of the wall to create a great deal of texture. Such applications are ideal for a long straight run of wall without additional cost of using two kinds of stone. Stone veneer allows a great deal of complex masonry in a very small space. Here the look is rustic old world stone in a Mediterranean style. The cap is composed of large rectangular solid stone blocks for visible heft and stability. Such stonework is excellent for disguising problem masonry areas where moisture accumulations result in efflorescence. Minor discolorations appear to be just another variation in the stonework, thereby helping to solve a problem through thoughtful material selection. Whether it's an engineered wall on a cut slope or a short seatwall to hold back a raised bed, veneered retaining walls ooze high end luxury. 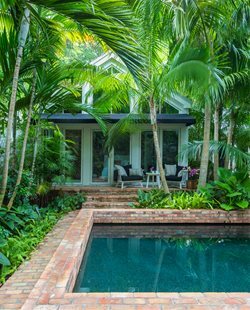 This is the landscape architects' specialty because virtually any outcome can be created using this type of construction. The veneer itself is merely aesthetic, but inside is the solid core wall that does all the work. These retaining walls can be designed in virtually any thickness and height, although any over four feet will require an engineer to specify footings and reinforcing steel. This provides the designer with an open end for solving problems with a superior product that's unique to your project since every one will be different. It is this stone wall look that the concrete wall unit manufacturers are desperately trying to reproduce with prefabricated units that mimic natural stone. Though some may appear similar, they'll never retain the value of a custom stone veneer wall. Stone veneer can be applied to a new or existing CMU block wall to give it a facelift. 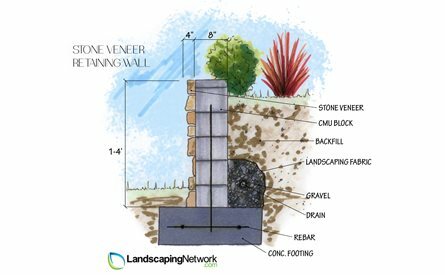 A stone veneer retaining wall must be well designed, and usually requires a landscape architect or a very capable design-build company for construction drawings. Quality stone masons are recommended for the veneer itself. The ultimate dimensions of each wall design change according to pressures caused by climatic extremes. 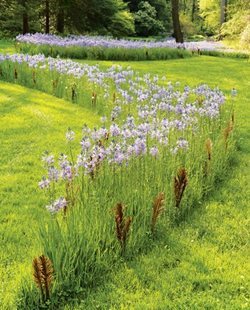 Illinois landscape architect Marco Romani explains. "We must extend our footings below the frost line, which here is at 42" below grade to make sure they are stable in extreme freeze thaw conditions. Once the wall reaches grade we change to a concrete block for the core of the wall, which is later veneered with stone or brick." Such deep footings require a great deal of underground concrete for each linear foot of wall, driving costs up considerably in northern states. "Our walls can run from about $190 per linear foot to as much as $260 for a high end seatwall with natural stone veneer." Romani also emphasizes the importance of matching stone used on architecture with any specified for the landscape walls. 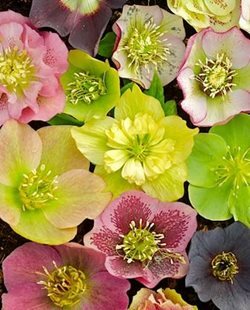 "We use stone mined in Wisconsin from a few different quarries. Even though we bring a catalog to show our customers, that's just to help them select a veneer style. Those stone photos are altered to over-saturate the color so we never trust them. To really match their house stone we obtain a physical sample to verify the color. Often we ask a manufacturers representative to come out to the site and see the house stone so that they decide on what product is the best match." 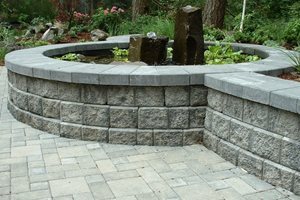 Romani leaves nothing to chance, and at the price of theses walls, insist on an equally competent and detailed oriented designer for your veneer retaining walls. 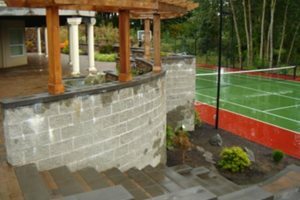 In the Pacific Northwest, Woody of Woody's Custom Landscaping utilizes a very different approach to stone veneer. "We use a lot of cultured stone because its light weight and the color choices are great. We can offer fifty different looks obtained from a single source. We've had great success with river cobble, block flagstone and honed stone and because it's easy for us to install, we don't have to hire stone masons. This gives our clients the great look of stone with a less expensive alternative."